It never fails: every January, people are going to make some New Year’s resolutions. Some are easy to follow, while others are more difficult. Maybe doing a little crafting can help you keep your resolutions this year. Here are some common resolutions and how you can enhance them. Eat healthy. 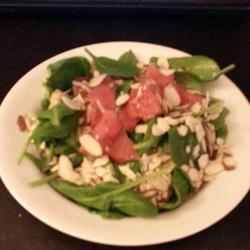 This one won’t be hard if you make delicious healthy food, like this spinach and grapefruit salad that MareMare made. It looks all kind of good! Drink more water. Water is so good for you, and many people don’t drink enough in a day. 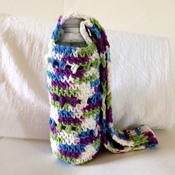 Keep your water nearby using a water bottle holder like this one, by LadybugsAndBumblebees. Read more. This one’s definitely on my list this year. Make a great bookmark to hold your place. 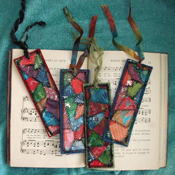 I love these paper patchwork bookmarks by alteredmommy. She provided a wonderful tutorial in her post. Get more exercise. This will be easier if you have the right equipment. Going to yoga? 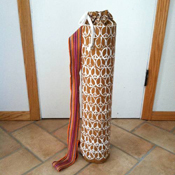 How about a nice bag for your mat? Abbeeroad decorated hers with hand-stamped peace signs. Last but not least: relax. Take some time for you. Put your feet up. 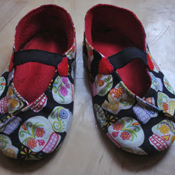 Make sure they’re cozy with some nice slippers, like these by papilionette. You can make them yourself, using her tutorial. I hope you’re having a lovely holiday season. Enjoy the rest of 2017, and here’s to a brighter 2018.